There is some science involved in getting better video sound quality. Let me show you how it works. Sound quality can make or break your video. This setup is one way of getting great quality sound. Get better sound with a boom pole. [Click To Tweet]. Mic hacks for home studios. [Click To Tweet]. James here. I’ve just been filming today and I normally get questions about sound quality because it’s gone up dramatically. I’m getting a more distant shot now with my DSLR so you can see the Canon 60D here. In the background there is the boom mic. So I’ve got a NTG3 microphone, riding on a boom pole that is just above my head so we go down there and have a look at that in a little more detail. So there’s the camera and the cable is running along there up to the stand to the grip to the Rode boom pole to the NTG3 mic. And on the floor is a thick carpet that’s going to absorb the sound as the mic points down. And when I stand down here, I put my toes in the marker, I always use a marker, I’m using a nice car magazine and right up here is the mic and that is just near my head and just above the top of the shot and this is what’s getting a good sound. But today, I’m just using my large mic and the iPhone to record this particular video so you’re not listening to this particular microphone that we’re looking at but that’s how it works. So I hope you’ve enjoyed that little microphone update. And let me know what you think of the sound of my newest videos on SuperFastBusiness.com. I’m James Schramko. Catch up with you next time. Tell us what you think of the better sound quality. perfect. I use laptop on top of bar stool on bench combo with a clicker for long videos. Cool Thanks James. I may try it for interviews. I’m still using 2 Sennheiser lapel radio mics which lets me vary the volume for quiet subjects. But it is always good to shop for new toys. I used them for a long time until I got sick of changing batteries and clipping on. I like the hands free nature of a wired Shotgun mic. Only one 9v battery now for the Beachtek. Makes sense. Does the beachtek power the Rhode mic? My Beachtek doesn’t have batteries. Yes, it has 48v phantom power. What iphone video app do you use to record that allows a mic input for sound? I’ve been searching for that for forever. They all just use the inboard mics, I think. Thanks! I am loving these videos! Notice that you have a mixer between your camera and mic – Do you feel this is this necessary? I have the poor mans setup – canon 600d with rode videomic (3.5mm connections) and there is an unacceptable hiss that can be taken out post production (with quality losses) but I think perhaps the mixer may be the solution. If you are looking for ideas for future videos – just understanding your lav mic/ iphone setup I would love to know. It is actually quite amazing how good the quality of that is. Cheers! Thanks for your response Tim – really appreciate it and very interesting. I am in Canada too but I am in Toronto – so not so white :-) My Mic has 3.5mm connection as well though – but perhaps an adapter will be fine. Thanks James and Tim! I purchased the Beachtek – the quality is so now much better. 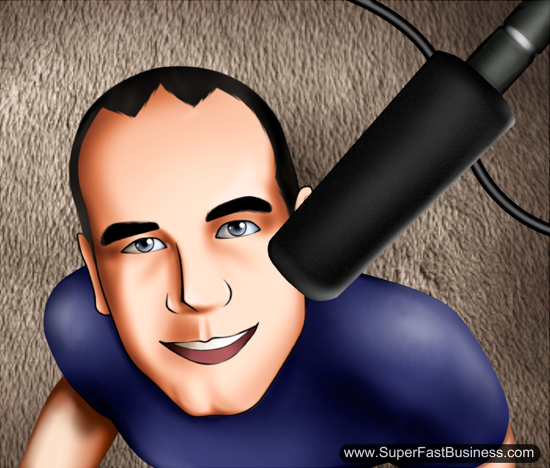 Listened to your podcast today with John Lee Dumas – you are right that was a great interview. Hitting record on my second podcast tonight. Cheers! Thanks James I just purchased my first boom microphone yesterday looking forward to the higher-quality audio. I’ve been filming my videos using my podcasting mic but once you get a few feet away the quality quickly diminishes. Good stuff!